The phrase “That’s Not Fair” seems to have become an all pervasive phrase connected to raising kids. Because of that we picked fairness as one of the first three video programs that we did. Young children usually define what is “fair” according to their own needs and desires of the moment. Parents, however, do not need to give in to a youngster’s definition of fairness. Each little one is an individual, created by God with a one-of-a-kind personality and a special learning style. Therefore, parents need to be able to respond to the unique needs of each child, without necessarily setting absolute standards according to age. In disagreements between siblings it is important to avoid becoming a referee. One way to help children problem-solve is to ask: “What are some possible reactions to this situation?” Then, together, you can list some solutions and decide on a course of action. Remember that adults are models for children’s early understanding of God. Sometimes we think the Lord is unfair, but God intends every situation for our good. Three to four year-olds reason through intuition, not logic. They have difficulty understanding relationships and rules. So, in their self-centeredness, they think that “fair” is whatever they want. Parents can help them be positive by coming up with creative alternatives in conflict situations, and avoiding “no” and using “yes” whenever possible. For example, children this age may think they are too “big” for naptime, so parents could call it a “quiet time,” and even allow them to look at picture books while on the bed. Three and four year-olds may also be encouraged to make trade-offs, that is, to bargain and do something parents want them to do (like nap) in order to do something that they want to do (like play outside). Create “lifelines” for each family member. List duties and freedoms they acquired at various ages. They are different as they get older. Fill in the blanks in this sentence: “When I was ____ (age), I could ______________________ (something you did then). When I am _____ (age), I will _________________________ (something you’ll do). Play the “Take Turns” game! Player 1 makes an animal noise, which the others repeat. Player 1 selects another player, who makes an animal noise, which the others repeat. When everyone has had a turn. You could take turns making funny faces or naming friends. Work together as a family to make fruit salad. Even 3 year-olds can help cut fruit with plastic knives, under supervision. 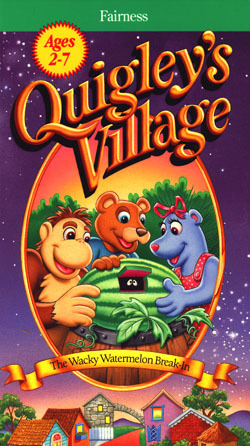 The video that ties into this value is “The Wacky Watermelon Break-In.” In this video, Spike, Danny and Bubba let their imaginations run wild as they become space farmers. All summer long they’ve tended to their “space garden” eagerly anticipating the harvest of a very large watermelon. As Mr. Quigley begins to slice open the watermelon, they are shocked and disappointed to discover someone has made a home out of it. Important lessons on fairness and sharing are taught. Encourage your child’s imaginative development by providing props to help children engage in make-believe play. For example, in the imaginative adventure on the video, Spike and Danny and Bubba became “space farmers.” You might want to provide props for youngsters to pretend they are mail carriers, like Molly. Collect used envelopes, an old typewriter, used stamps, tape, boxes, paper, a large handbag, a hat, a large box for a mailbox, rubber stamps and pad, paper, pencils and crayons. “Things I can Do Myself,” Craig John Lovik. St. Louis, MO: Concordia Publishing House, 1986. “A Child’s Good Night Book,” Margaret Wise Brown. New York: Harper and Row, 1986. “God Cares When Someone Else Has More,” Elspeth Campbell Murphy. Elgin, IL: David C. Cook, 1987.